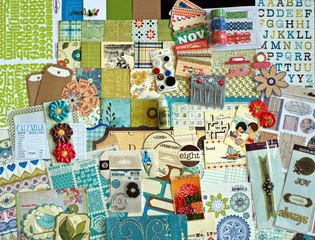 For weeks I stalked the Noel Mignon site enjoying all the previews of her upcoming kit, Sweet Sue. I fell in love with the blue/green color scheme and had to make it mine. The kit shipped from California on Friday and was in my hands on Monday. Now, that is service! Since I had been (im)patiently waiting for the release of Mockingjay, the final book in the Hunger Games trilogy, I knew if I was going to use this kit any time soon, I better get started. Mockingjay was going to be released on Tuesday. 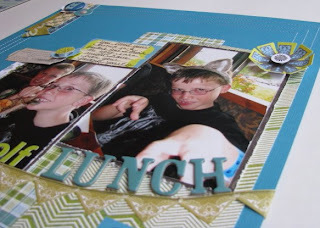 So, I stayed up late on Monday and created this layout: "2 little pigs." In addition to items in the kit, I added an October Afternoon "pig" card that came in a set I had added to my kit order. I thought it was fitting to use with this photo of my boys chowing down on ribs. Since we were on our mini vacation in this photo, I thought the cars paper by Making Memories was also appropriate. However, I didn't finish the layout until Sunday. I used a rare "one-photo-tells-it-all" photo from Kevin's last tournament of the summer. He made a play that he said was one of the best moments in his life. It deserved a page all its own. I let the LONG title tell the story. 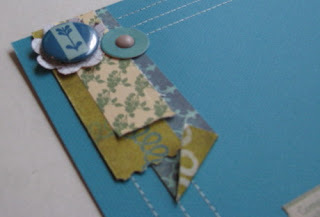 I added a few items from my stash for this one: a Sassafrass Lass chipboard 3, new mini tickets from Maya Road, and a cute "Oliver" clip from Basic Grey. Everything else was in the Sweet Sue kit. I've been all out of sorts this week and after staring at my scrap space for too long, decided to look online for some inspiration. 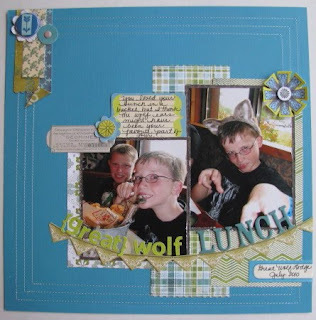 I came across a layout by Jana Eubank that I decided to lift - "Pouring on the Charm." I scrapped photos of Kevin having lunch while we were on vacation. Since I used the WRMK stitched cardstock for my base, I opted to skip Janna's stitched circle. I stuck pretty close to her layout, but did make a few changes. In addition to items in the kit, I also added some items from her previous kits and a new chipboard alpha by Cosmo Cricket. I have to admit when I saw the birds in the kit previews, I debated not getting this kit. I'm just not a bird person. But, when the kit arrived, I instantly had an idea for the bird accent - LOVE birds. I had snapped these shots of Blake and his current crush this summer. The ruled paper gave me the space to tell the whole story. I've been almost life-long friends with this girls' mom. 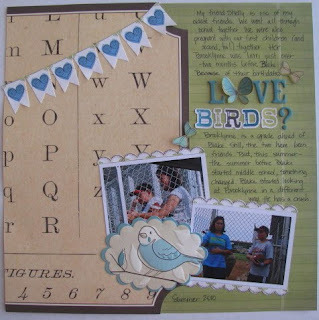 I love the "love birds" layout...way cute. Wow--amazing how much you made already with that kit. Love them all but especially the LOVE birds. You always impress me with the way you can find ways to use product you might otherwise not have used.